We gathered the kids for a debrief. Chris, Carl and I took turns. The theme was poor husbandry, especially kit. I started with: “I had a good night’s sleep last night. I was warm, comfortable, and dry. I have no bites and no midges got in my tent last night. If you look after your kit, it will look after you. You all know that these last few days have been an emotional rollercoaster. I felt very proud of the things you have done, then minutes later I sank low. Yesterday, I walked behind a group across the moors, through 4 gates. Each one had litter, which can only be yours. Two of those gates were left open. The expedition was characterised by am emotional roller-coaster. I felt break high when I saw girls urging their groups on, making quality navigation decisions and developing their confidence. 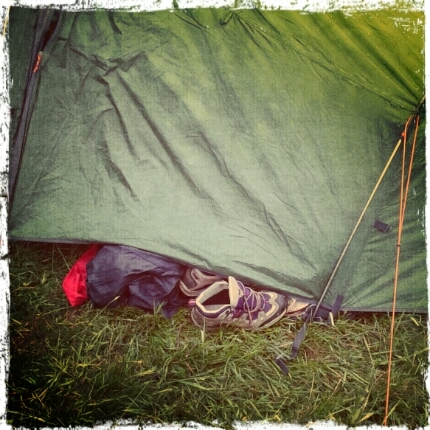 One badly erected tent, and one yet right boot, left out for the night. For staff, we spent the whole week on this project. Not just the whole week, we totalled a 74.5 hour week of contact time. It was both exhausting and exhilarating at the same time. I have no hesitation to do it again. As it happens, that’s just what we’re going to do. Twice. This entry was posted in DofE and tagged bronze practice expedition, DofE. Bookmark the permalink.